What is Flow and what is the Player Journey? 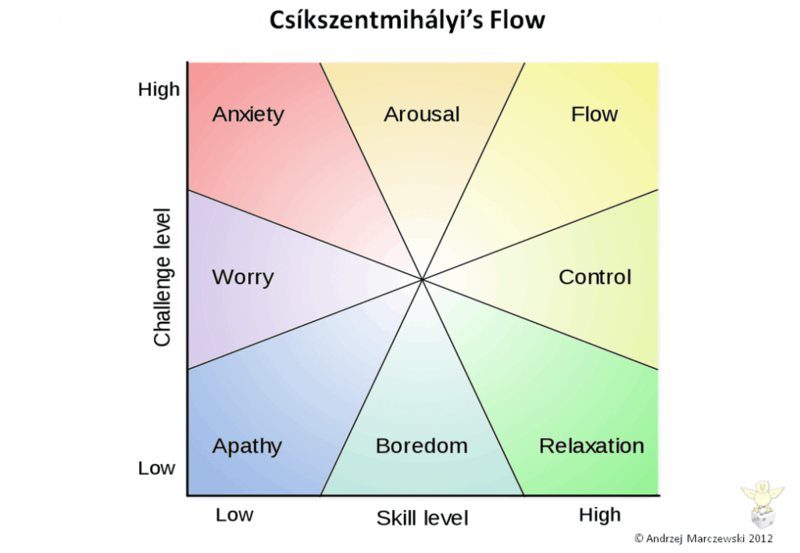 Mihayi Csikszentmihalyi suggested the concept after seeing that under certain conditions people’s experiences became optimal. This is to say that everything around them was lost as they concentrated on the job at hand. This can be seen in many artists who just “get into the grove” as they work. Time stops, nothing else matters and when they finally come out of it, they have no concept of how long they have been working. He identified some key factors that could lead to such a phenomenon. In 1997 he provided the world with the following visual representation of his theory. It is worth noting that the centre point of this chart is where we tend to be on average. When talking about games, the tendency is to simplify this idea, concentrating instead on the concept of flow as a channel between boredom and anxiety or frustration. As we can see here, if a challenge exceeds the abilities of the current skill level, it can lead to frustration. 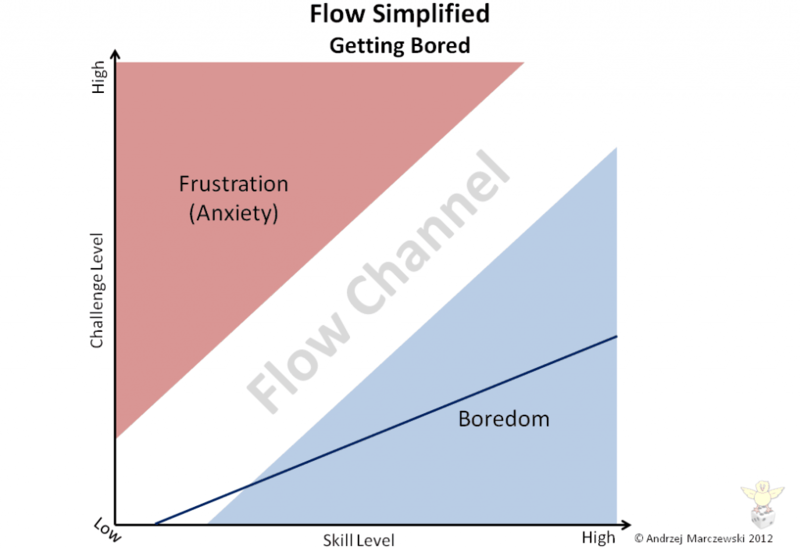 If the skill level is increasing faster than the challenge, it leads to boredom. Both of these will normally end with the player leaving the game. Amy Jo Kim wrote about the idea of The Player Journey. 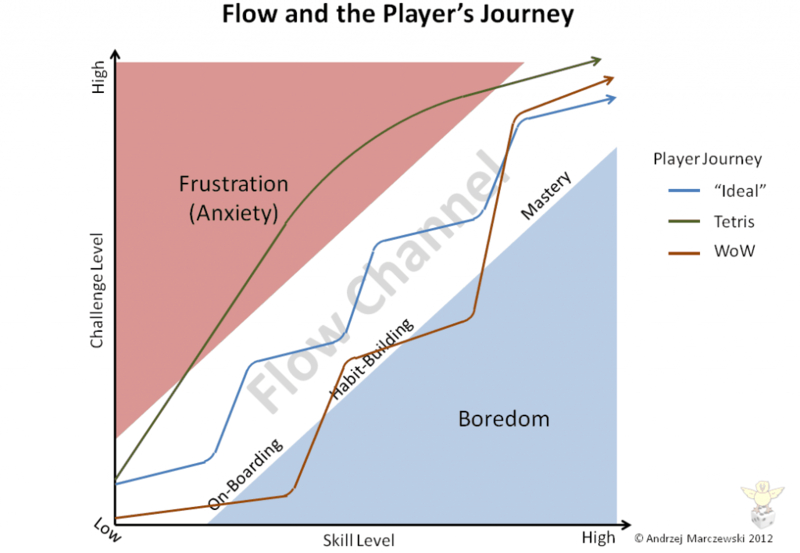 “Great games are compelling because the player’s experience and expertise changes over time in meaningful ways.” The graph shows this as a journey towards mastery. You start off easy, to get into the game. The difficulty then moves up a bit as things become more habitual within the game. Eventually you are into a phase where you have learned all the skills you need to achieve master of the game. Again, this takes the idea of skills and challenges increasing over time together. 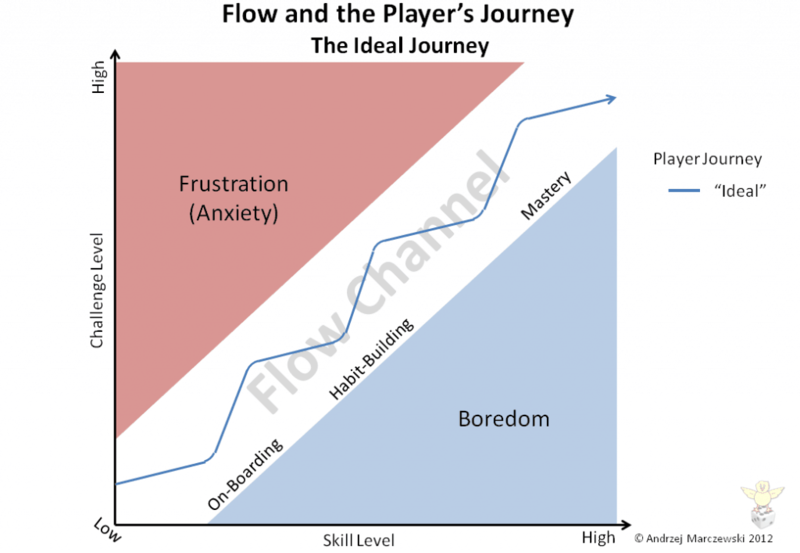 If we combine the ideas of Flow and Player Journey, you can begin to see how a game, in theory, should behave in an ideal world. You start off with a challenge that is acceptable for a new comer who is starting in the game – on-boarding. Over time, you increase the challenge as skills increase. Most games tend to build up each level to a boss battle of some type. In this graph we could imagine that each peak is a boss battle. This is can really be seen as a test of the skills you have just been learning. As you progress in the game, the challenge increases as your skills increase. In our ideal game that keeps you in a constant “Flow” state, you never cross over into boredom or frustration. In gamification, this has being seen as the ideal path to take when designing your experiences. But, is it actually how games play? Not all of them. You could argue that a game like Call of Duty, one that is linear in nature, follows a similar path. You start off slow (ish), build up to some adrenaline pumping moment, then you lull back down to a more sedate pace, before ramping up to the next set piece etc. 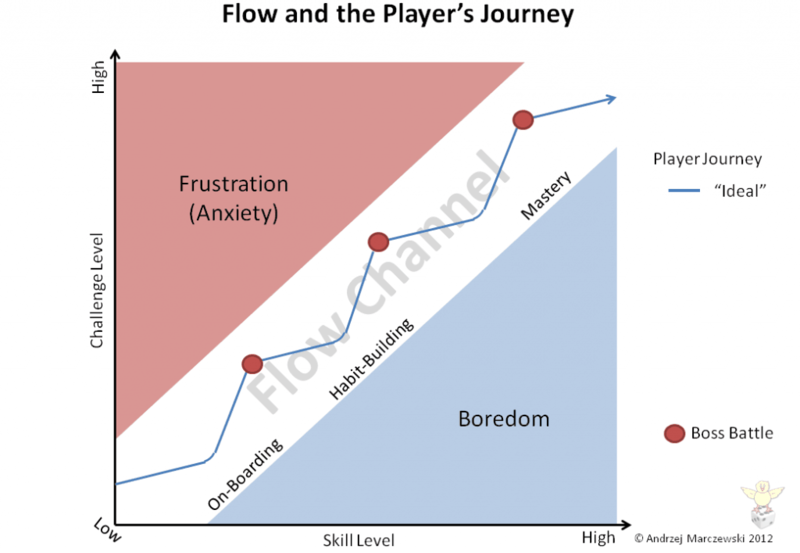 Mastery of the game is often achieved quite early on, but the action around you prevents you from dipping into boredom more than the challenges do – much like watching a film. Then you have a game like Tetris. There are no lulls in the progression with Tetris. It just gets faster and faster. 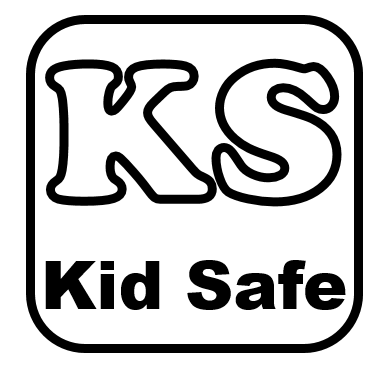 Whilst the early stages are quite easy, it quickly overtakes your skill level. At first, this can be very frustrating, however, as you keep playing you start to skill up to the challenge. Eventually, even though it will still always beat you, you hit a point where it is enjoyable and you no longer care. Time stops, parents nagging go quite, there is just you and Tetris– flow. At this point, you are into the Mastery phase of your Player Journey. Then you have more RPG like games, World of Warcraft comes to mind. In these, the on-boarding seems to go on forever. Grinding away at very low challenges to get to the good bits. When you get to them though, the challenge often ramps up and you find that the skills you have been learning in the “boring” bits lead to exciting challenges that you can just about handle. However, these challenges are often scattered and there can be significant time between them. Also, there are many times when you just don’t have the required skills to complete them. So whilst you are building your skills you do spend more time grinding and skimming along the boring edge of our chart. There often comes a point where your skill level is just right for the challenges. This may have been the result of a steep learning curve, but relative to your skills this, this does not lead you to the frustration zone. This is where you start to head into mastery of the game. The challenge continues to increase, but at this stage your skills are a match for the pace. Then there is a game like Hexagon on iOS. This is a game that just starts off hard and gets harder. It is unforgiving and unrelenting in its challenge. The strange thing is, games like Hexagon can still get people coming back for more. Many people, it seems, would rather be frustrated but seeing some progress in skills, rather than bored, devoid of challenges but getting better at it. How could this possibly apply to work and employee satisfaction? 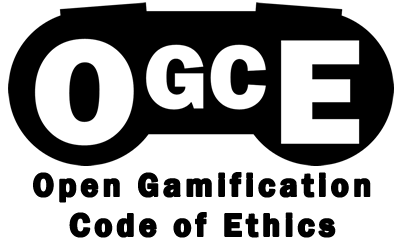 If we take a look at this with a gamification hat on. 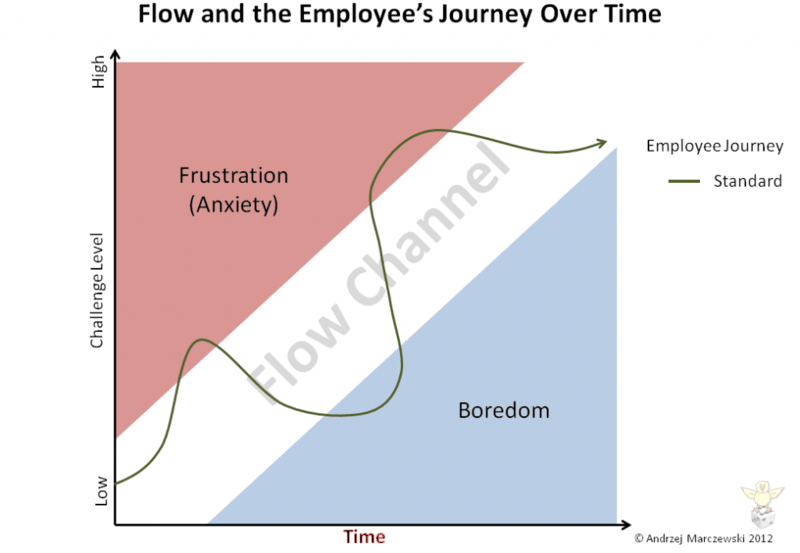 The ideal would be to have all work sitting in the Flow channel. But is it feasible to expect a persons skill set to increase over time? Personally I think this is the secret to keeping a happy employee. Keep the challenge there and keep their skills if not increasing at least up to date! Nothing is worse than the challenge never increasing and your skill set ever decreasing through lack of use. Using this kind of thought process for employee induction, you can see that this ideal journey can be achieved. Letting the employee learn about the company and their job in a “game” like way will help to keep them interested along the journey. Swap boss battles for training or CBT style testing and we have a very similar looking chart to out “ideal” game flow. However, after this it can become a little more difficult – especially for the more seasoned employee. 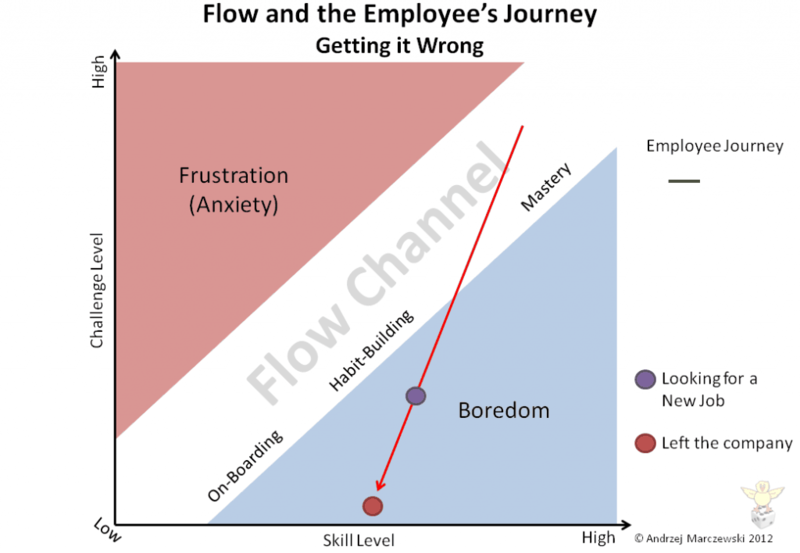 If someone comes to your company with 5 years experience, then (if we are to believe the 10,000 hours to mastery theory from Malcolm Gladwell), they will actually start high up on the skill level. Even with a high starting skill, the challenge is likely be high at the start. However any experienced employee in a new role will hopefully be motivated enough to get past that. It is what happens from there is really important. How do you keep your experienced “masters” engaged. You have to keep the challenge and skill level as balanced as possible. If we look at a player journey over time, it will dip into the boring zone and the frustrating zone regularly. What is important is to make sure that the challenge is always there and that over time the skill set does not dwindle. Balance is the key. What we don’t want – and what many people who are switch jobs will cite as a major reason – is the challenge to dwindle over time as well as the skill set. If an employee is not using their skills to complete appropriate challenges, they will leave! Can we learn anything from this? The key is to make sure the skill and challenge levels are always heading in the right direction. SPECTACULAR. Congratulations!, full of useful straight and sharp knowledge. Dude, this is a freakin awesome post. Great blend of theory and practicality of applying gamification to engage employees. Great article. I think every company should have a “journey to mastery” designed for all business areas. wow. so fascinating. thank you. never, never, never knew any of this. There is way more too it, but I am only just at the start of my understanding 🙂 Worth reading up on though!! If you are interested in motivation and the like, Daniel Pinks: Drive is a must read! Behawioralne i psychologiczne wpływ na gamifikację. Flow.